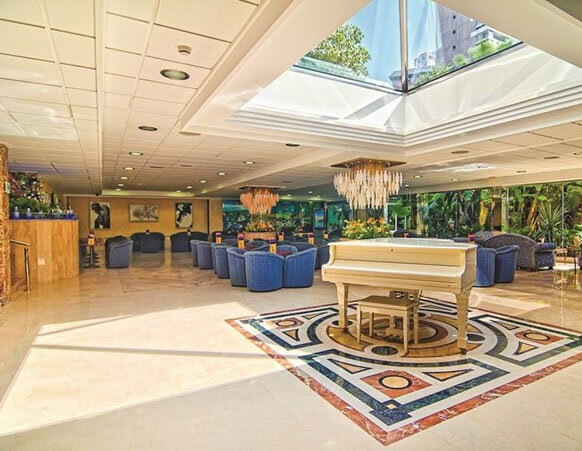 The award winning 4 star Hotel Servigroup Diplomatic has an enviable central location just a few metres from the popular Triangular Square and only 220 metres from Benidorm's famous Levante Beach. Its numerous facilities, together with its prime location make this hotel the ideal place to enjoy your holidays, short break or business trip. 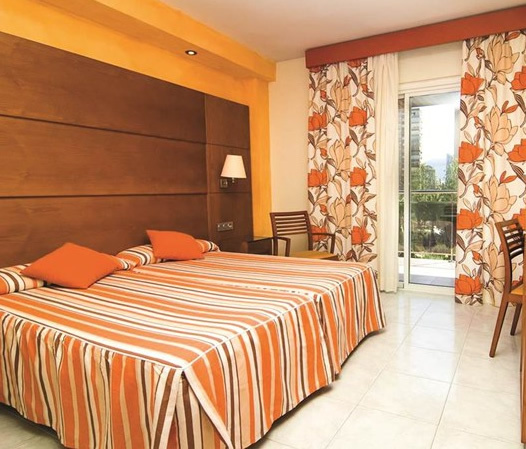 Taxi transfers take around 45 minutes to make the 35 mile journey from Alicante airport. The hotel has 252 comfortable and spacious rooms equipped with: air-conditioning/heating, full bathroom, hair-dryer, balcony, flat screen TV, direct dial telephone, mini-fridge, safety deposit box (supplement) and card locking system. The flat screen TVs provide a new digital system with around 60 national and international channels plus 15 music channels. In addition the hotel has 10 double superior rooms. There is Free WiFi connection throughout the hotel, including rooms. The hotel's buffet restaurant serves a select and varied range of hot and cold dishes including themed dishes, delicious desserts, vegetarian choices and a Menus for celiacs (please inform us before departure or at check-in. The hotel has 'Show cooking' where delicious high quality fish and meats are prepared on an open grill and cooked in front of you. At breakfast time you can enjoy pancakes, omelettes of your choice, fried and poached eggs are just a few of the choices available from the breakfast buffet. In the evenings you can enjoy a cocktail in the Spacious and elegant lounge bat that overlooks an interior tropical garden complete with waterfall. 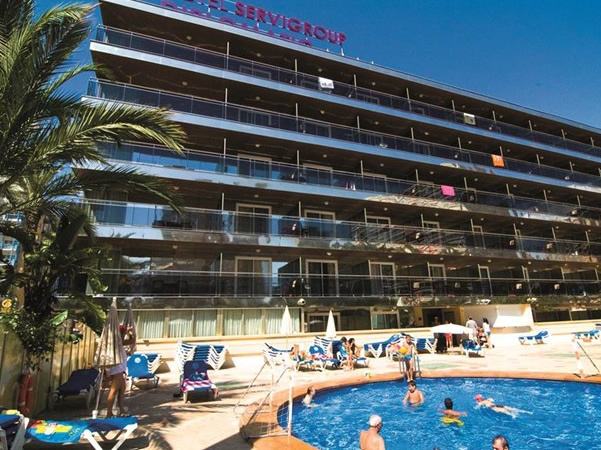 There is a large sun terrace with four swimming pools (electrolysis disinfection) two for adults and two for children surrounded by sun loungers and parasols. 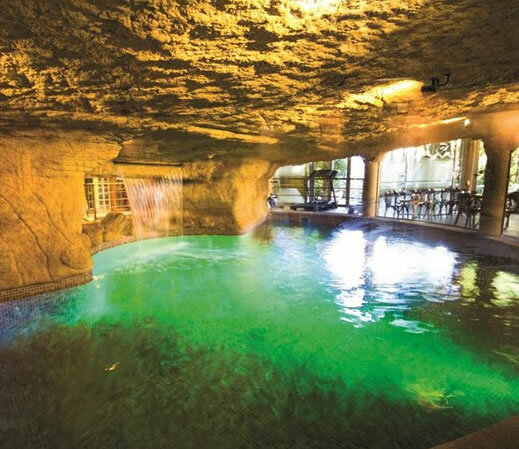 To exercise and to aid relaxation the hotel Diplomatic has a Wellness Centre, this atmospheric centre is attractively decorated with rock and waterfall features, here adults You can enjoy the Wellness Circuit that includes sauna, Turkish bath, jacuzzi, fitness area and heated swimming pool. The hotel offers a varied entertainment daytime programme in high season, and also live music at night. The hotel has a 24 hour reception. 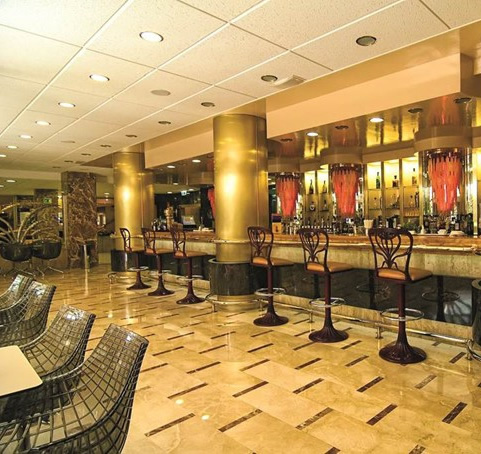 There is complimentry Wifi throughout the hotel, a Servigroup shop/boutique with souvenirs, gifts and accessories. Computer with Internet connection at the reception area (supplement) and a fax facility. The hotel has 110 hotel-owned covered parking spaces (supplement). There is a laundry service. It is also possible to exchange currency and rent a car (you can always pre-book your car hire before departure please ask us for a quote! ).